The Irish Scrapper: Birthday Blast....A Must Have Stamp Set! Today, I'm sharing a card using one of my FAVORITE stamp sets from the Occasions catalog. I chose this design straight from the catalog. 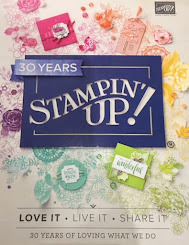 For those of you new to Stampin' Up!, our catalogs and flyers are also idea books. There are a TON of ideas in them. If you're having a brain freeze or need a quick design...don't forget to look at the catalog. If you purchase the Balloon Adventures Bundle, you will get a FREE Sale-A-Bration item too! January 2017 Stamp Club Giveaway! !